Our lawyers advise on how to effectively protect your wishes when preparing a Will and your entitlements as a beneficiary. Can I challenge a Will? Brendan Nyst explains when to claim against a deceased estate. Have you been left out of a Will? Call Nyst Legal for a *FREE initial consultation. Have you been appointed an executor? Call Nyst Legal for a *FREE initial consultation. Our lawyers understand the stress and uncertainty that can occur when a loved one passes. The additional pain that the lack of a well-considered Will can bring to a family can be avoided. Estate disputes can be costly and can lead to broken relationships. An important thing to be aware of is that Wills and Estates are closely linked. Most estate disputes can be avoided before the death of the testator when the testator makes his or her Will. A well drafted and well considered Will, done early, is the best way to minimise estate disputes later. The following events have been identified as triggers. If you think that a Will is important for you, view our information videos and contact us to discuss your circumstances. Have you been left out of a family member’s Will? 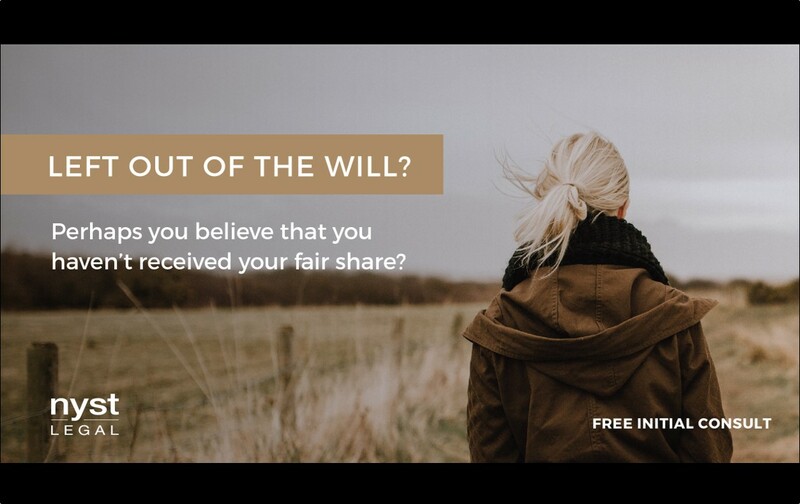 Perhaps you believe that you haven’t received your fair share of the estate of a recently deceased? The deceased did not completely understand what they were doing when they drafted their Will. Despite the wishes of the deceased, they had a moral duty to leave you with a share of their estate. The deceased was unduly influenced by a third party. The beneficiaries cannot agree on what is to happen to the estate property. There have been unauthorised or unfair transfers of assets during the life of the deceased. 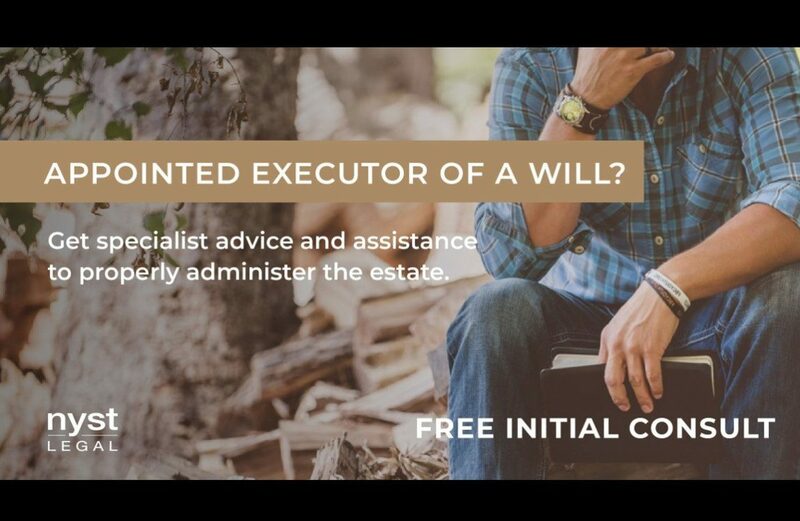 The executor appointed under a Will has apparently influenced the testator in making the appointment or apportioning the bequests. A home-made Will is deficient in some way, i.e. there is ambiguity in the terms of the Will, doubts as to how it was executed by the deceased, or issues of undue influence, duress or even forgery. *Our team has a wealth of experience in dealing with deceased estate disputes. Whatever the circumstances, we will ensure that you get your fair share of the estate. Call Nyst Legal on 07 5509 2400 to arrange a FREE 30-minute confidential initial consultation. Our expert lawyers will provide you with the right advice on whether you are able to make a claim. If you have been appointed the Executor of a deceased estate, it will be your duty to manage the estate for the beneficiaries. Managing assets under a testamentary trust. This can sometimes be a lengthy and complex process, particularly if the estate is large and contains a broad range of assets. It is important that you obtain proper advice and support from competent lawyers to ensure that you not only maximise the return to the beneficiaries, but comply fully with your duties as Executor and trustee of the estate. *If you require advice in respect of the management of an estate, call Nyst Legal on 07 5509 2400 to arrange a FREE 30-minute confidential initial consultation to discuss your personal circumstances. We can provide you with the specialist advice and assistance you need to properly administer the estate. What if I die without a Will? Gisele Reid, Gold Coast Lawyer, explains the implications. Can I challenge a Will? Brendan Nyst, Gold Coast Lawyer, explains. I’ve been named Executor of a Will. Hear from Brendan Nyst on your obligations.